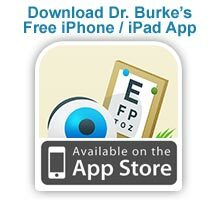 As Cincinnati's premier children's eye specialist, Dr. Burke's office features a dedicated "KidsZone" that is designed to put your child at ease and ensure your child's happiness throughout their visit. An almost 600 square feet waiting area which is well lit by natural light from 5 large windows and offers a wonderful combination of space for adults and an activity and entertainment area for children and their families. Plenty of seating with 17 regular chairs and 5 child size chairs. Enclosed theater room (which we like to call the "nook") with two 5 foot vertically off-set seating benches that is dimly lit so as not to bother those with dilating pupils. A separate table with iPad which is packed with many fun games. Two Nintendo 64 game systems each for one or two players. A touch screen interactive game player with over 140 different games. An old fashion 4’ by 5’ chalk board which provides the children lots of creative options. A magnetic sand table and a 4-sided activity tower which offers lots of fun for the smaller crowd. 40-50 up-to-date magazines are available at all times. Two large boxes of children's books for kids to browse through. We know that any visit to the doctor can be scary for children, but as a leader in children's eye care Dr. Burke takes every step to keep your child at ease.